In the driveway this week is a wee little thing: The Smart Electric Drive, or ED (note the clever logo on the car's pillar ... get it?). This "amped" up ForTwo is all electric, which means no more terrible transmission like on the gas version . Instead, it's a single speed. Initial impressions are that it's got good pickup from 0-40, but the thrust peters out after that. I've had it up to 55 mph thus far, but it will take a while to get there. Some interior bits seem flimsy, such as the turn signal stalk and some dash bits. However, this urban runabout is incredibly nimble and compact. The coiled-up charging cord is also an EV first for us. Luckily, it's long enough to reach our exterior outlet. And yes, it's small enough to be parked on our concrete patio slab. More later ... stay tuned. I kinda like it. 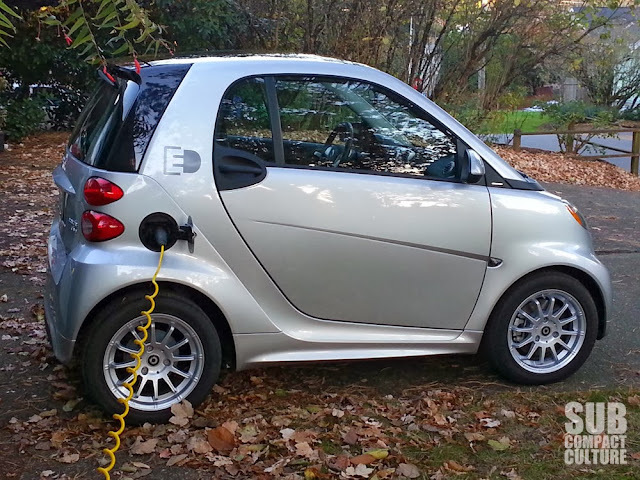 Electric fits the size and style of the Smart to a T. It's what the Think EV would be if they hadn't contracted Rubbermaid to do the coachwork.